Until fairly recently and the arrival of mass production and the disposable consumer society, the art of forging, shaping metal using heat and pressure, was central to the running of any community. 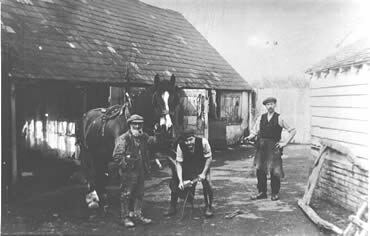 From shoeing horses to making metal objects for use or decoration, business, agriculture, transport and domestic life depended on the skillful work of the smith in his forge. 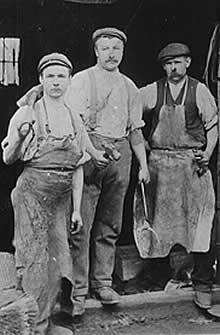 The census records show that on average there were 14 people employed as black smiths, farriers or wheelwrights in Marden at any one time. Not surprisingly here were several forges in and around Marden. The one pictured below is Rootes’ Forge at the West End. 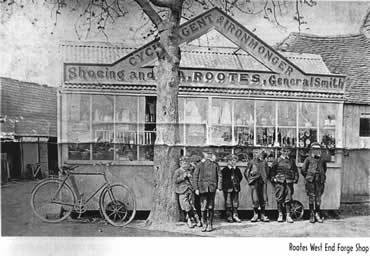 George Rootes, the owner, was related to the famous car firm. At one time the Forge house and the West End Tavern were one unit and George ran both. Allegedly he spent too much time quenching his thirst, which he could not afford, so had to give up the pub and devote his time to smithing. He died at the forge and was succeeded by a Mr Johnson. Another forge was Bourne’s Forge in the High Street. This was run by old Mr Bourne who was succeeded by his sons, Frank and Harry. The forge was there for many years. 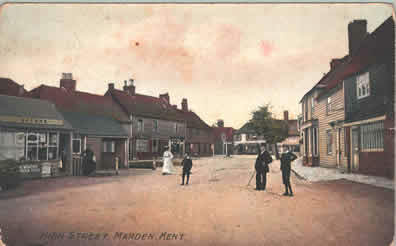 After it was demolished, Sutton’s shop was built on the site and later new housing, the present Sutton Forge.